This is a view from the top of the hill, looking westwards, with the Snow Road in the distance. Myrtleford is 15km distant, by road, to the north-east. 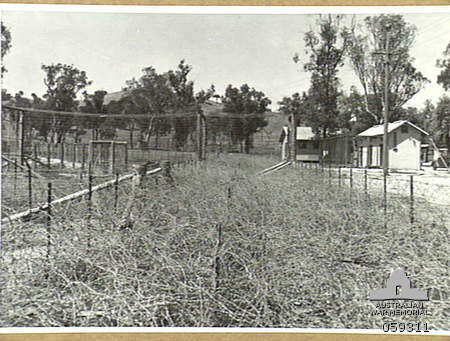 Perimeter fencing, two fences about, with barbed wire in between. The secure holding cells are seen in the top right. Note that they are outside the Compound. There were two musters of prisoners daily. The Camp Church is the the background. Commandant of the Camp was Major Borella, seen on the mid right. Note one prisoner giving the Fascist salute. This a group of Officers, dressed in their uniforms for this photograph. 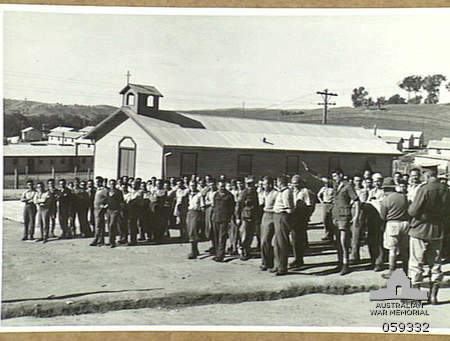 On all other occasions POWs were clothed in maroon uniforms. These photographs were taken in November 1943 by Mr Somebody . At the time of taking these photographs there were 439 Officers, 129 Other Ranks and 10 Hospital workers. A full list, in alphabetical order of all POWs at this time is available from the Myrtleford & District Historical Society inc. This is the only building left today. This was erected by the prisoners in 1942 to celebrate Mussolini's birthday. It was smashed and scattered after the Camp closed.